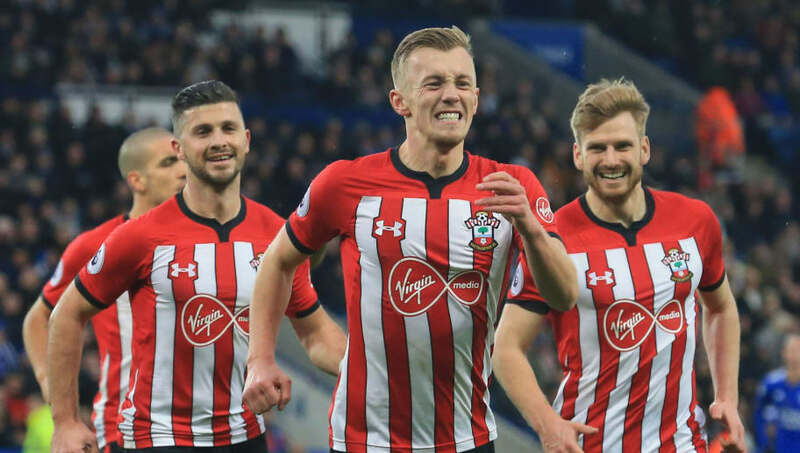 10-man Southampton side were able to hold off a second half onslaught as they secured a narrow 2-1 win over Leicester City at the King Power Stadium. Southampton began kthe game the better of the two sides, and were awarded an early penalty after a clumsy challenge from behind by Nampalys Mendy on Shane Long, a penalty which James Ward-Prose stepped up to take. Kasper Schmeichel got a hand on it, but couldn't keep it out as Southampton took the lead. ​Leicester began to grow into the game after going behind, and were given more reason to be optimistic on the stroke of half time. ​Southampton's young full-back Yann Valery was given his marching orders having picked up his second yellow card just 10 minutes after being shown his first, but the home side's optimism was very short lived. In injury time heading into the break, a lapse in composure by Mendy at the back allowed Long through on goal, tucking the ball past ​Schmeichel to double the visitors' lead despite being down to 10 men. Ralph Hasenhuttl would've been delighted with his side's first half performance, but was given cause for concern at the start of the second. Ricardo Pereira made a darting run down the right hand side and out the ball into a dangerous area, where the ball then struck Wilfred Ndidi's thigh and trickled into the back of the net to peg one back for the hosts. Unfortunately that was as good as things got for Puel's men as they just couldn't find a way past the Saints' defence despite piling the pressure on late on. Despite finding themselves seventh in the ​Premier League table even after the defeat, the Foxes now have real cause for concern. The loss to Southampton was their third in their last four games in all competitions, and given the fact that three of their next four games are against teams in the top six, Saturday was a day on which really Leicester needed to win. After going two goals behind, they bombarded the visiting defence with balls into the box, but were left frustrated as they just couldn't find a way past a resolute Southampton defence. It wasn't the result they were hoping for, and Leicester will need to improve heavily if they are to get out of their losing run sooner rather than later. Starting XI: Schmeichel (6); Pereira (7*), Morgan (6), Maguire (6), Chilwell (6); Choudhury (7), Mendy (4), Ndidi (7); Albrighton (6), Maddison (6), Vardy (6). Substitutes: Barnes (7), Gray (6), Ghezzal (6). STAR MAN - On a day of few positives for the Foxes, Pereira proved to be a real threat down the right hand side for the Foxes. It was his neat play on the wing which set up Leicester's only goal of the game, unfortunately his teammates couldn't find a way past the Southampton defence on what was a disappointing afternoon for the Foxes - although he can at least hold his head up high after a solid performance. WORST PLAYER - Mendy certainly won't look back at his performance with fond memories, having been at fault for both of Southampton's goals. He gave away a penalty courtesy of his clumsy challenge on Long in the area, before he then lost possession in his own penalty area allowing Long - again - through on goal. To cap off what had been a torrid day at the office for the Frenchman, he wasn't even given the chance to redeem himself in the second half as he was substituted at half time with the damage already done. It was a resilient performance from a Southampton side who were in desperate need of a good performance. They set the tempo of the game early on and deservedly went two goals ahead after a solid first half showing. They were always going to be up against it in the second half, with Leicester throwing everything at them with a man advantage, but the Saints defended resolutely and dealt with almost everything that was thrown at them. They've now picked up seven points from their last three away games, and they will certainly fancy their chances of survival if they can replicate these kind of performances towards the back end of the season. Starting XI: McCarthy (7); Valery (4), Bednarek (8), Stephens (7), Vestergaard (7), Targett (7); Romeu (6), Ward-Prowse (8); Redmond (7), Armstrong (7), Long (9*). Substitutes: Soares (6), Slattery (6). STAR MAN - In a team who put in a superb performance on the day, Long was the pick of the bunch. He's always a nuisance for opposition defenders and he proved to be no different against Leicester, always closing down defenders and leaving them with very little time on the ball. He got his reward for his efforts on the stroke of half time with his endeavour earning him a chance on goal, which he duly dispatched to double his side's lead heading into the break. The Saints fans gave him a standing ovation when he was subbed off with 15 minutes remaining and he definitely deserved it. WORST PLAYER - It really was an afternoon to forget for the Frenchman Valery. He found himself in a tussle with Ben Chilwell after his high challenge on the Englishman, before then missing a golden opportunity to double his side's lead when he was left unmarked at the far post. Unfortunately he couldn't keep his composure and squandered his chance. His afternoon was then cut short when he picked up his second yellow card on the stroke of half time having pulled back Marc Albrighton on the edge of the area. He'll be thankful he didn't cost his team too dearly, but he did his team no favours. Leicester will hope to end their losing run when they travel to Molineux to face Wolves on Saturday, whilst Southampton will look for more of the same as they host Derby in an FA Cup replay on Wednesday night.